THREATS: Biological Attack — Are We Ready? Biological Attack — Are We Ready? Imagine the nightmare scenario of an attack from a terrorist group or hostile nation. It probably involves a radioactive blast and a mushroom cloud, right? What about an attack that involves germs and surgical masks? How does that factor in? The reality is biological attacks may be just as devastating as the typical terrorist attack. 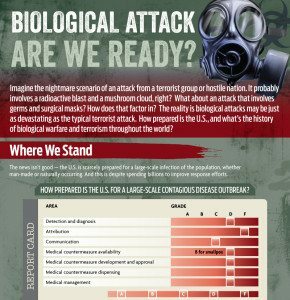 How prepared is the U.S., and what’s the history of biological warfare and terrorism throughout the world? The news isn’t good — the U.S. is scarcely prepared for a large-scale infection of the population, whether man-made or naturally occurring. And this is despite spending billions to improve response efforts. How prepared is the U.S. for a large-scale contagious disease outbreak? How much does the federal government spend on preparedness? That’s more than the National Institutes of Health spends on HIV/AIDS, immunization, mental health and women’s health. BioWatch operates in about 30 cities across the country, reportedly including Philadelphia, New York, Washington, San Diego, Boston, Chicago, San Francisco, St. Louis, Houston and Los Angeles, though the cities where it operates have never been officially released, and criticisms about the program remain. Spores are found readily in nature, can be produced in a lab and can last for a long time in the environment. Contact with anthrax can cause severe illness in both humans and animals, though it is not contagious. A muscle-paralyzing disease caused by a toxin made by a bacterium called Clostridium botulinum. Foodborne botulism is the most common cause of infection. It’s most frequently transmitted to humans through dairy products, but those who spend time around infected animals are also susceptible, such as hunters, veterinarians and meatpacking workers. Death from infection is rare (only 2% of cases), but recovery can take several months. Plague is caused by Yersinia pestis, a bacterium found in rodents and their fleas in many areas around the world. Yersinia pestis used in an aerosol attack could cause cases of pneumonic plague. Without early treatment, pneumonic plague usually leads to respiratory failure, shock and rapid death. Smallpox is a serious, contagious and sometimes fatal infectious disease. There is no specific treatment for smallpox disease, and the only prevention is vaccination. Last reported case of smallpox in the U.S.
Tularemia is a potentially serious illness that occurs naturally in the United States. It is caused by the bacterium Francisella tularensis, which is found in animals (especially rodents and rabbits). Tularemia is not known to be spread from person to person. The disease can be fatal if it is not treated with the right antibiotics. p>The world is no stranger to people using diseases as weapons. Arsenic smoke is used by the Chinese. In a sea battle, Hannibal of Carthage hurls clay pots full of vipers onto the decks of enemy ships. Bodies of plague or smallpox victims are hurled over city walls. The Spanish offer wine spiked with the blood of leprosy patients to the French . Polish artillery general Siemenowics fires spheres filled with the saliva of rabid dogs at his enemies. British officers come up with a plan to distribute smallpox-infected blankets to Native Americans at Fort Pitt, Pennsylvania. German artillery soldiers fire 3,000 shells filled with dianisidine chlorosulfate, a lung irritant, at British troops. The shells contained too much TNT, which destroy the chemical. Allied troops make their own chlorine gas attacks; Germany comes up with diphosgene gas; the French try cyanide gas. Germany introduces mustard gas, which burns the skin and lungs. German chemist Gerhart Schrader comes up with nerve agent tabun (later called German agent A or GA). Two years later, he develops sarin. British and U.S. researchers develop VX, a nerve gas so toxic that a single drop on the skin can kill in 15 minutes. Researchers at Fort Detrick, Maryland breed yellow-fever-infected mosquitoes. The International Red Cross says mustard gas and possibly nerve agents were used by the Egyptians against civilians in the Yemen civil war. 23 U.S. servicemen and one U.S. civilian are exposed to sarin in Okinawa, Japan, while cleaning bombs filled with the deadly nerve agent. The U.S. and Russia sign a treaty banning the use of biological weapons, and the U.S. claims by the following year to have destroyed its weapons. A Soviet bioweapons facility releases a plume of anthrax, killing at least 64 people. Thousands could have died if the wind was blowing the other way. Despite the treaty banning biological weapons, the Soviet program had been going full speed. Iraq attacks Iran and soon unleashes a mustard agent and the nerve agent tabun, delivered in bombs dropped by airplanes. Followers of a cult member running for a county judgeship in a local election sprinkle homegrown salmonella bacteria on supermarket produce, door handles and restaurant salad bars in Oregon. Nobody dies, but 751 people become ill. Residents of Matsumoto, Japan, develop symptoms of illness due to nerve gas. Seven die and 500 are sickened. A second attack in 1995 strikes a Tokyo subway, killing 12 and infecting thousands. A newspaper editor in Florida dies of anthrax traced to a letter. Anthrax-laden letters also turn up at the offices of ABC, CBS, and NBC in New York. Anthrax is also found in the New York office of Gov. George Pataki. Letters containing anthrax also arrive at the U.S. Senate mailroom.